WKU and Central Texas College have signed an agreement providing a seamless transfer path to a four-year degree. The articulation agreement, signed Wednesday (Oct. 12) in Fort Knox, will allow CTC students who transfer to WKU to carry with them the credits they have already earned for as much relevant study as possible. In addition, CTC students completing associates degrees can earn a bachelor’s degree without taking additional general education courses. Central Texas College, headquartered in Killeen, Texas, has a worldwide presence in higher education. CTC’s Fort Knox site has provided higher education opportunities to service members, their families, veterans and civilians in the area for over 20 years. Through more than 100 CTC sites on military installations worldwide, students may receive assistance, information and take courses in the classroom, not just during deployments abroad or while stationed in Texas. Jacqueline Jenkins, Fort Knox Education Service Officer, called the partnership an exciting opportunity joining two of the five higher education providers at Fort Knox. 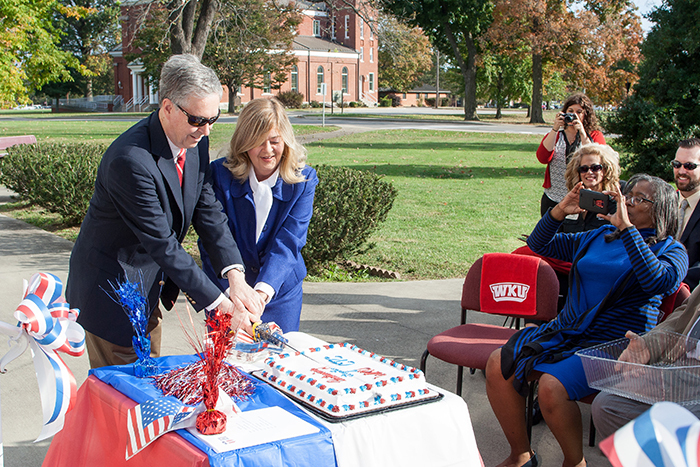 WKU Provost David Lee said WKU is committed to providing more services leading to better opportunities for military personnel and those who are transitioning from the military. CTC Site Director Pamela Regester said the concept of partnership has been around for several years and this particular partnership is the result of months of discussions. Dennis George, WKU Associate Provost for Regional Higher Education, said the agreement is more than a pen and paper exercise. “The signing of this document formalizes the academic partnership between two outstanding institutions and opens clear and well-defined educational pathway options for thousands of students worldwide,” Dr. George said.